Fast charging and battery management systems for electric vehicles have become more popular as commuters rely on energy efficient options for transportation. With commuters moving away from flex-fuel based ethanol mixtures, electric vehicles are becoming more standardized and environmentally friendly. 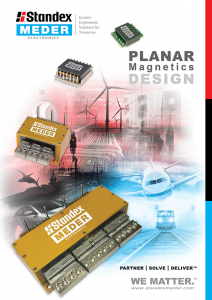 Standex Electronics has developed various products including planar transformers for use in eCars. The P560 and P900 planar transformer series with a combined 5kW-30kW power range have transformed the efficiency within inverters in fast charging units. Furthermore hi-current planar inductors can serve within the same efficient, low-profile packages. For example, a manufacturer approached Standex Electronics with the challenge to provide a reduction in height of 50% from a traditional wire-wound transformer and create a custom solution that met their specifications. All this, while maintaining their footprint with higher efficiency and exceptional thermal management. The engineered custom solution included a planar transformer customized to fit their manufacturing and functional needs. 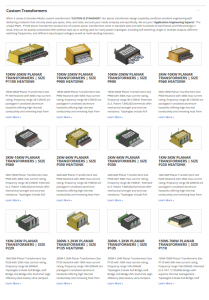 Our custom and standard planar transformers serve a wide array of power ranges with low, medium, and high frequencies ideally suited for electric vehicle fast charging and battery management systems. 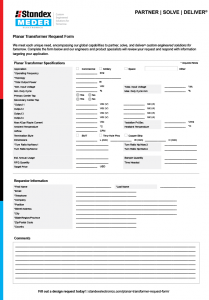 To provide the best possible planar transformer and inductor information, please fill out our custom planar transformer and planar inductor request forms.